Fresh Pea Soup, either hot or cold, Thyme for Cooking. This would be lovely with actual fresh peas, but they are not so easy to find unless you have your own garden. Frozen peas are thought (by the experts) to actually be better. Make certain you get plain peas - no butter or sauce. This is equally good hot or cold. Clean and thinly slice leek. Add the leeks and celery and sauté until leeks are tender, about 7 minutes. Add 1 1/2 cups chicken stock, basil and peas. Cover and simmer until peas are tender. Purée soup in a blender or using an immersion blender. Return soup to heat and add as much of the remaining 1/2 cup chicken stock as desired (or more) to get the consistency you like. 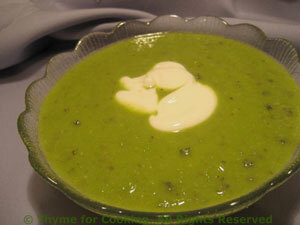 Ladle into soup bowls, garnish with a dollop of yogurt if you have some, and serve.